Gravity Drive is a move from Sonic Riders: Zero Gravity. Enabled by wielding one of the Arks of the Cosmos (although in Free Play it can be performed by any character), Gravity Drive sees the user manipulate gravity to blast themselves forwards at high speed. 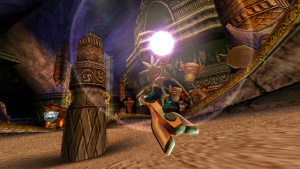 It is a vitally important technique in single-player mode (particularly when trying the Sonic Simulator missions), necessary to win several races and beat the game's last boss, Master Core: ABIS. The Arks of the Cosmos are gravity-controlling devices created by the ancient Babylonians thousands of years ago. At the start of Zero Gravity, they find their way into the custody of Eggman, SCR-GP, Jet, Tails, and Amy, with posession changing hands many times over the course of the game. Sonic activates the gravity-control accidnetly in the game's opening cutscene, where it saves him from a grisly death at the foot of Megalo Station. Gravity Drive starts in the form of an explosion of light, putting nearby objects in zero-G even in-game, where obstacles will float up in the air if you activate near them. The user then flies forwards rapidly. This page was last edited on 11 April 2010, at 17:23.